Here in the Golden West (otherwise known as California) where I live, I’m fortunate to be able to visit my local zoo most days of the year, with little fear of snowdrifts or icy winds—no excuse, perfect sketchbook weather. And the exotic deer and antelope therein are happy to be out and about, and inclined to play. 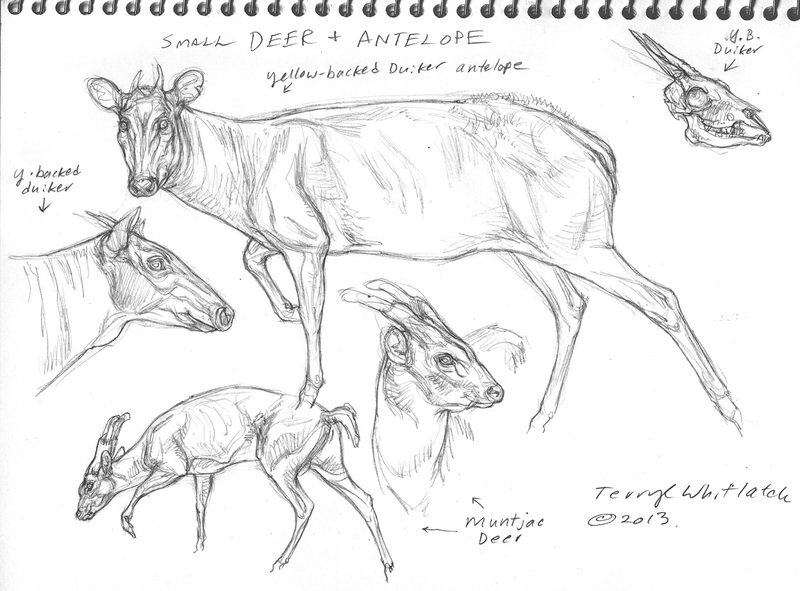 Here, from my sketchbooks, are two of my favorites, the African Yellow-Backed Duiker antelope and the Eurasian Reeves Muntjac deer. In their relatively small size, habits, and bodily conformation they seem similar, inhabiting brushy undergrowth of forestland, but zoologically they are worlds apart (as well as continents). Why is this important to an artist? Anatomy. All animals are classified in terms of their anatomy, a system called Cladism. Animals that are anatomically similar are grouped together and further organized into Classes, Orders, Superfamilies, Families, subfamilies, genera, species, and subspecies, even tribes. While both muntjacs and duikers belong to the order Artiodactyla (cloven hoofed mammals), the muntjac is zoologically a deer, and thus belongs to the family Cervidae, since it has a lot more in common with whitetails, wapiti, and yes, even moose, anatomically than other hoofed mammals. The duiker, on the other hand, has an anatomy that is more similar to those of elands, oryxs, kudus, and bison, and belongs to the family Bovidae. Interestingly, if you make a study of classification, and zoom out a bit, you’ll see that the muntjac is more closely related to a giraffe than it is to an antelope! Realizing this, one becomes sensitive to the physical characteristics, however subtle, of the differences between these two species. In the brow, and the turn of a nostril, I can discern a cousinly similarity of a duiker to a Holstein, and the sloe eyed glance of a muntjac mirrored in the gaze of the local black-tailed deer that live in the hills around me. The significance of this, artistically speaking, to capture form, personality, and character is self-evident. Once more, things are definitely not what they seem at first glance, and animals indeed always, interestingly, and delightfully so, surprise us.